Babe Ruth and Lou Gehrig were on opposite sides during their 1927-1928 Barnstorming tour to put on some of the most star-studded exhibition matches in baseball history. The Bustin' Babes and Larrupin' Lou's was the brainchild of Christy Walsh, who was Ruth and Gehrig's longtime agent. In 1927, Walsh, in order to capitalize on the excitement generated by the duo's season-long home-run duel, arranged to have the pair tour the country right after the World Series. 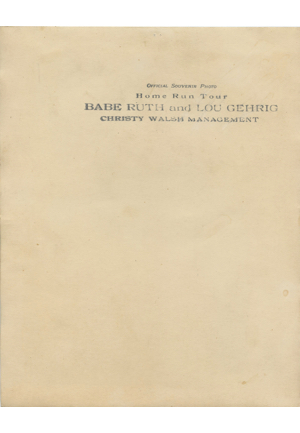 The tour, heralded as "Ruth vs. Gehrig - The Battle For The Home Run Title Continues," began in New York and made its way across the country, ending in California. 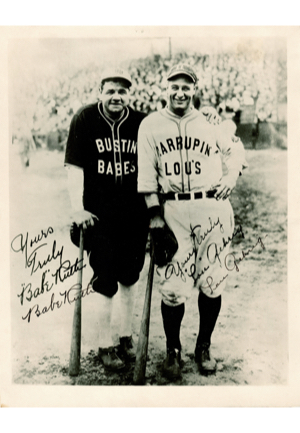 This original black and white photograph of Ruth and Gehrig was made available to the public as a souvenir during that year’s tour when the “Bustin’ Babes” and “Larrupin’ Lou’s” squared off. The 8” x 10” photo captures the two stars posing together in their respective tour uniforms. 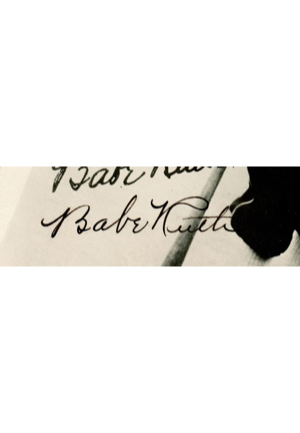 These special photos were available for sale for $1, a very large sum at the time and carried facsimile signatures of Ruth and Gehrig with the phrase "Yours Truly". 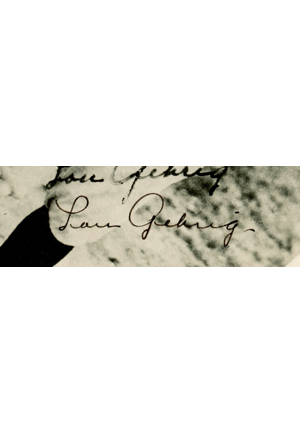 This unique offering features Ruth and Gehrig hand-signed live autographs under their respective names in black fountain pen. In our opinion, the autographs rate a 9 overall. 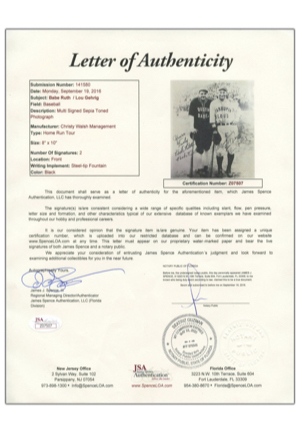 On the back of the photo is a stamp that reads, “OFFICIAL SOUVENIR PHOTO Home Run Tour BABE RUTH and LOU GEHRIG CHRISTY WALSH MANAGEMENT”. It is incredibly rare to find any version of this photo signed by both players in this excellent condition. Accompanied by a full James Spence Authentication LOA. Auction closed on Thursday, December 8, 2016.